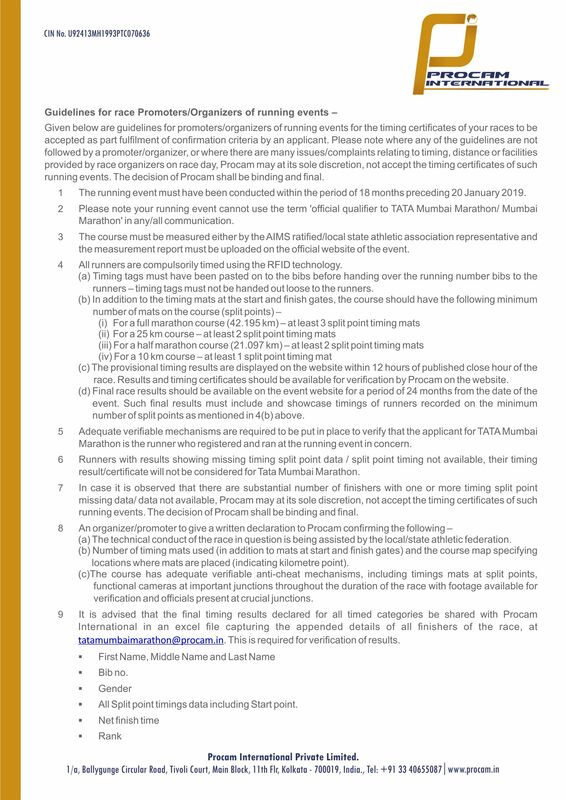 Entry to the half marathon race category is only against a timing certificate (except limited places for Women’s criteria & Charity running places), as elaborated below. You must have fulfilled the requirements mentioned below, under each criterion, in order to apply for the half marathon category. The running event must have been conducted within the period of 24 months preceding AIRTEL DELHI HALF MARATHON 2018 race day, i.e. 21 st October 2018. Timings of only marathon (42.195 km), 25 km , half marathon (21.097 km) and 10 km distances will be considered to qualify for the half marathon race category– timing cut-offs of each distance to apply for the half marathon category at Airtel Delhi Half Marathon 2018 as given below. Recognized timed relay races, where an individual runner covers a distance of minimum 10 km, will also be considered to qualify for Half Marathon race category only. The course is measured either by an accredited IAAF-AIMS measurer using the calibrated bicycle method http://aims-worldrunning.org/measurement/MeasurementOfRoadRaceCourses.pdf or by a local state athletic association representative using a GPS measurement device. Measurement by GPS device has been found to underestimate course length by approximately 200m over a half marathon distance so the target reading for a GPS-measured half marathon should be 1% more than the advertised distance, i.e. 21.31km. Equivalent GPS device target lengths for other race distances would be: 10km: 10.1km; 20km: 20.2km; 25km: 25.25km; Marathon: 42.62km. The measurement report must be uploaded onto the official website of the event. Please note your running event cannot use the term 'official qualifier to Airtel Delhi Half Marathon' or ‘qualifier to ADHM’ in any/all communication. For a 10 km course – at least 1 split timing mat. Final Race Results should be available on the event website for a period of 24 months from the date of the event. Such final results must include and showcase timings of runners recorded on the minimum number of split points as mentioned in 4(b) above. Adequate verifiable mechanisms are required to be put in place to verify that the applicant for AIRTEL DELHI HALF MARATHON 2018 is the runner who registered and ran at the running event in concern. Runners with results showing missing timing split point data / split point timing not available, their timing result/ certificate will not be considered for Airtel Delhi Half Marathon. The technical conduct of the race in question is/is being assisted by the local/state athletic federation. Runners with results showing timing split point missing data / split point timing not available, their timing result/ certificate will not be considered for Airtel Delhi Half Marathon. Number of timing mats used (in addition to mats at start and finish gates) and the course map specifying locations where mats are placed (Indicating kilometer point) on course map of timed race categories. To encourage women applicants’ participation, there are a limited number of running places reserved for women applicants who cannot submit a timing certificate or do not fall within the timings mentioned above. Limited charity running places are available at a premium with the Event’s official Philanthropy Partner, India Cares Foundation. The amount to be paid by the applicant will be minimum INR 5000( subject to change on the basis of availability), and after deducting applicable Event entry fee, the balance shall be remitted to the CSO–Civil Society Organisation (erstwhile referred to as NGO) registered with the Philanthropy Partner for the Event chosen by the applicant. Charity running places can be availed by applicants on first come first served basis. The application form for charity running places will be available with India Cares Foundation. Applicants who cannot submit a timing certificate or do not fall within the timings mentioned above can apply under charity running places. Please note, charity running places will not be available after 21st September 2018 or as soon as running places are filled, whichever is earlier. You may visit http://icfn.in/adhm/ for more details. Registration for half marathon (21.097 km) is open only for timed runners, applying with valid timing certificate as explained in “Timing Certificate Criteria”. This rule is not applicable for limited running spots that are reserved for “Women’s Criteria” & “Charity running places”. As and when the limit of entries to be accepted in half marathon is achieved, the registrations will close. Recognized timed relay races, where an individual runner covers a distance of minimum 10 km, will be considered to qualify for Half Marathon race category only. Post 15 working days of registration closure, individual applicant is required to go online and check his/her application status. Confirmed applicants of half marathon category who have provided valid timing certificates along with their application forms, will get priority in line-up on race day (21st October 2018). Line-up sections will be allocated based on the finish time mentioned on the timing certificates submitted at the time of application. *Half marathon line-up sections given above are indicative and may undergo a change which will be communicated on the event website, post closure of all registrations. Please note, on race day timing results and certificates will be generated only for runners who complete the half marathon distance within 3 hours from start time.